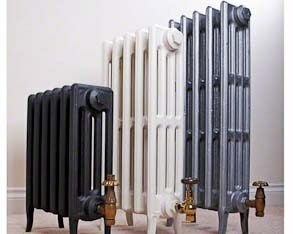 Below are simply a small selection of the Cast Iron Radiators we have on display in our showroom. For more information and prices call 01663 749027. We are able to supply a vast array of different cast iron radiators and as such encourage you to call us with your specific requirements on the number above, we are certain we will be able to help with what you require. Based upon neo classic designs popularized toward the beginning of the 17th century, these are simply, stylish and traditional looking radiators. 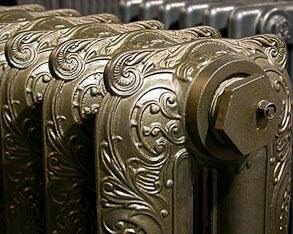 Art Nouveau is a difficult term to define at the best of times; in the world of designer cast iron radiators it is perhaps best described as elegant, complex designs with a classical fee. 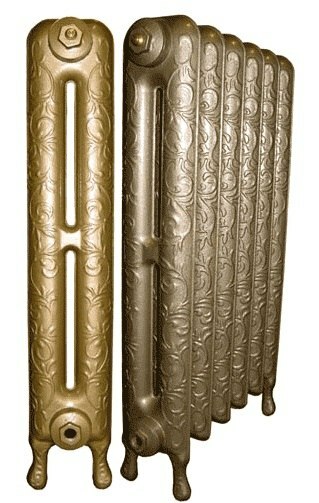 The Daisy Pattern cast iron radiator is named after the distinctive patterning style upon it. This is amongst one of the more customizable ranges, allowing you to dictate number of sections, columns and the height of your radiator, perfect for any traditional space. A very simple design, the princess is a highly customizable cast iron radiator based upon a truly classic design. 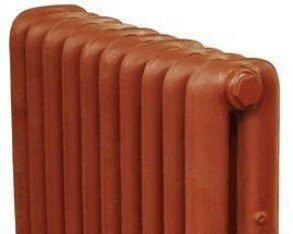 Created using moulds salvaged from original victorian radiator manufacturers, this radiator is available in any RAL colour. Another truly classical design, the victorian is a beautiful, flexible radiator (it comes with all of the customizability you can expect from a cast iron radiator) and is produced based upon original victorian casts. 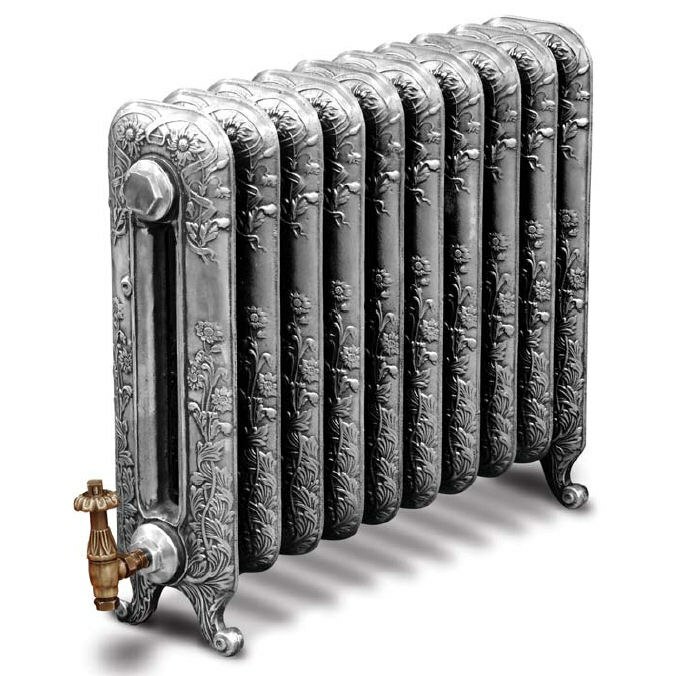 An extremely elegant and beautiful design, the Montmantre is a truly traditional looking cast iron radiator. Again extremely flexible, this radiator comes in a number of sizes and finishes, including both burnished and unburnished. 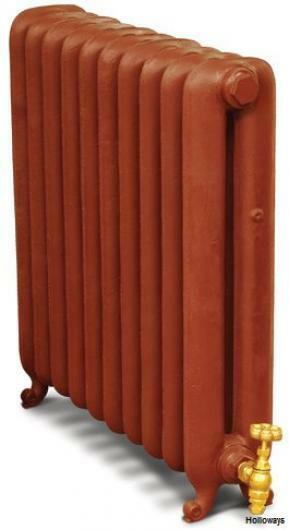 Cast iron radiators are perfect for giving a traditional room that designer feel. 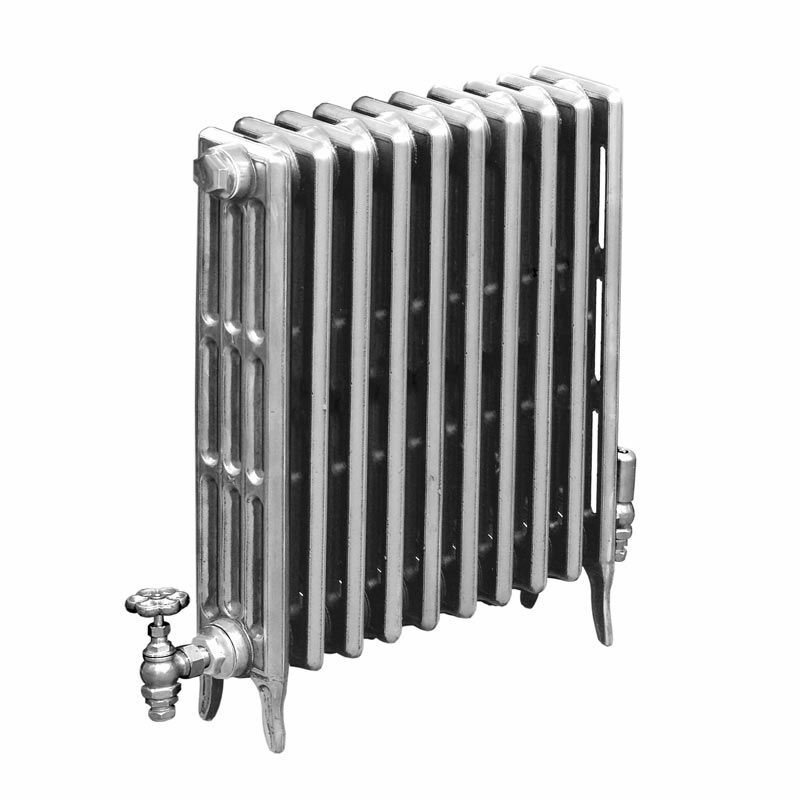 Used extensively to heat homes in the Victorian times, unfortunately cast iron radiators are no longer manufactured in the UK (most manufacturers simply import from overseas and assemble the radiators in the UK). There are however a huge array of designer cast iron radiators available and due to the fact they are made in cast iron (well obviously!) they can come in a variety of colours and finishes (in many cases RAL colours too – for all intents and purposes this means you can have your radiator in any colour you like). 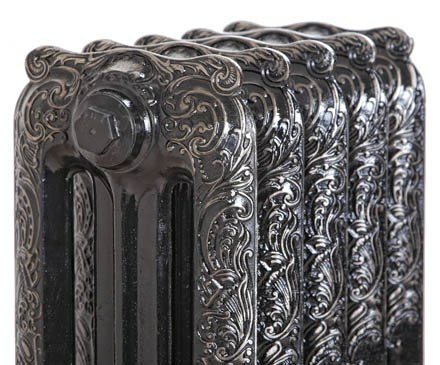 In addition to having plain coloured finishes, cast iron radiators can come “burnished” – this is a term which applies to highlighting the details on the radiator using a different coloured finish. 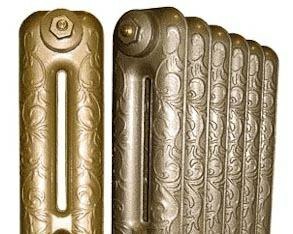 This can really bring out the detail giving your radiator a traditional feel by showing off the intricate patterning. 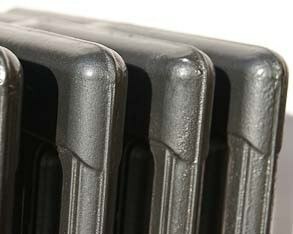 Another key benefit to choosing a cast iron radiator is their size is very flexible. 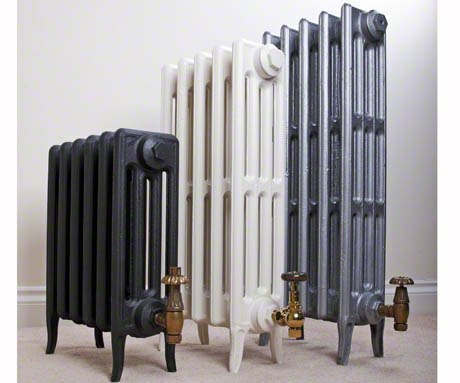 The size of cast iron radiators can be altered in three different ways; the number of sections, number of columns and the height of the sections. In many cases this means that once you have chosen the design you like, you can have a radiator constructed to produce the correct BTU for your room; ensuring it will fit in the space you have. 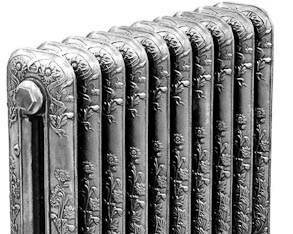 In cast iron radiator terminology, sections refer to what you would traditionally think of as the sections of a radiator, whereas the columns refers to the number of columns per section. This understandably a rather poor explanation of the terminology; so to demonstrate take a look at the Victorian cast iron radiator on display by clicking here. That radiator is a four column, ten section radiator. As you can see it is comprised of ten sections, each of which is split in to four columns. The height of such a radiator would also be flexible too meaning in most cases you simply need to find a design you like and then contact us (via phone on 01663 749027 or via email) and we can supply a radiator which perfectly matches your specifications. As with much of what you see on this website, we only show on the website what we have in our showroom meaning any of the radiators seen above can be viewed 6 days a week (Sundays on appointment); click here for directions to our designer radiator showroom. In addition to what you see on this page, we work very closely with a number of designer radiator manufacturers (as the largest showroom in the country we have an extensive list of suppliers) and as such can supply most radiators you desire. One such company we work closely with is Carron; they specialise in cast iron products including radiators, stoves and fire places. They have a fantastic range but do not sell directly to the public, as such we encourage you to take a look at their product range by clicking here and if you see any products you like please get in touch via the means mentioned above.